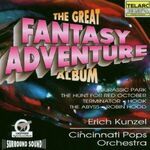 THE GREAT FANTASY ADVENTURE ALBUM. 03) JURASSIC PARK : T. Rex ! (sound effects) 0'54"
05) Splitting hairs. (sound effects) 0'05"